Title: Warning: Do Not Open This Book! GoodReads Summary: CAUTION! This book contains monkeys, toucans, and a whole lot of silliness. You really shouldn't be opening this book. It looks like a book, it feels like a book, and it even smells like a book. But watch out...madness and mayhem lie within! 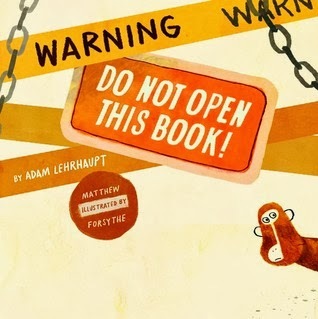 Debut author Adam Lehrhaupt urges you NOT to take a walk on the wild side in this humorous, interactive romp with inventive and engaging illustrations from Eisner Award-winning comic artist and rising star children's book illustrator Matthew Forsythe.This quirky, subversive creation begs to be enjoyed again and again and again. What I Think: We absolutely love this book in our house! I can't even tell you how many times Little Bean asks us to read it over and over. We love the suspense of knowing we shouldn't be turning pages but we still do. The monkeys are awesome. The illustrations bring them to life and page by page, they get closer and closer. These monkeys are really something else. They aren't afraid of anything. I love this book as a text to introduce close reading. You can easily read the story the first time and get a kick out of interacting with the text. Going back, you really notice the illustrations and how much they drive the story. Each monkey is unique and readers can follow their personalities from page to page. Readers can look at the size of the monkeys and other animals across pages and the colors Matt Forsythe uses as the story progresses. I particularly like the layout where the reader is learning about the plan and the role he or she plays in the plan. The outlined sketches and the lack of color signify the change in progression of the story. There are so many elements of this story for a reader to notice upon reading through a second...or multiple times. But most of all, this book is fun! I guarantee it will make young readers giggle with anticipation and delight as they contribute to helping the story unfold! "Oh, no. Now you've done it." Writing Prompts: Write about a time in your life when you did something you knew you shouldn't do. How did you deal with the consequences?